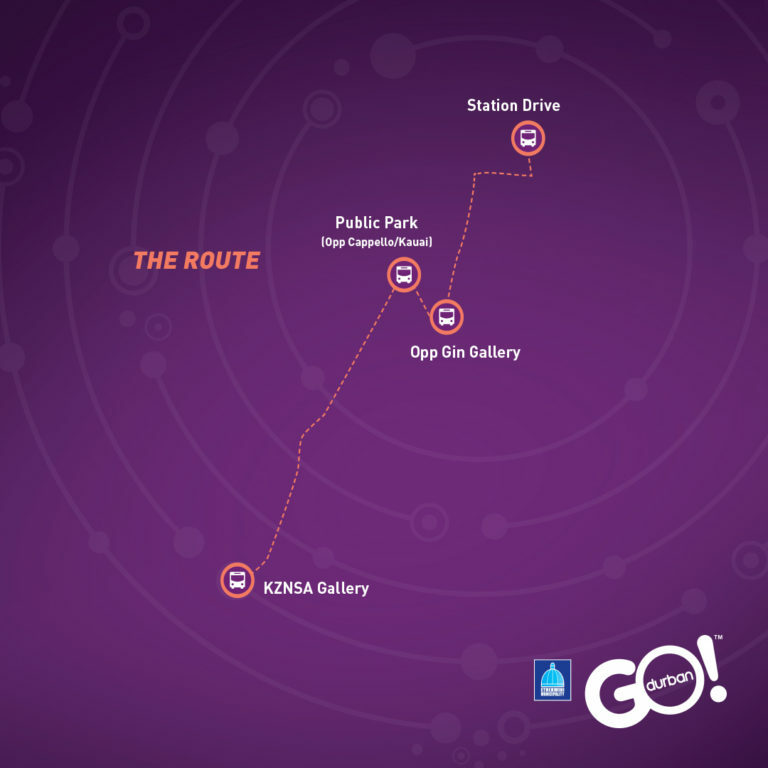 A Go!Durban pilot program, Connect031 will use the People Mover bus to provide a looping night service that links the KZNSA Gallery in Bulwer Rd with Florida Road and Station Drive, bringing together Durban’s First Thursdays hubs (activity at each hub noted below)! 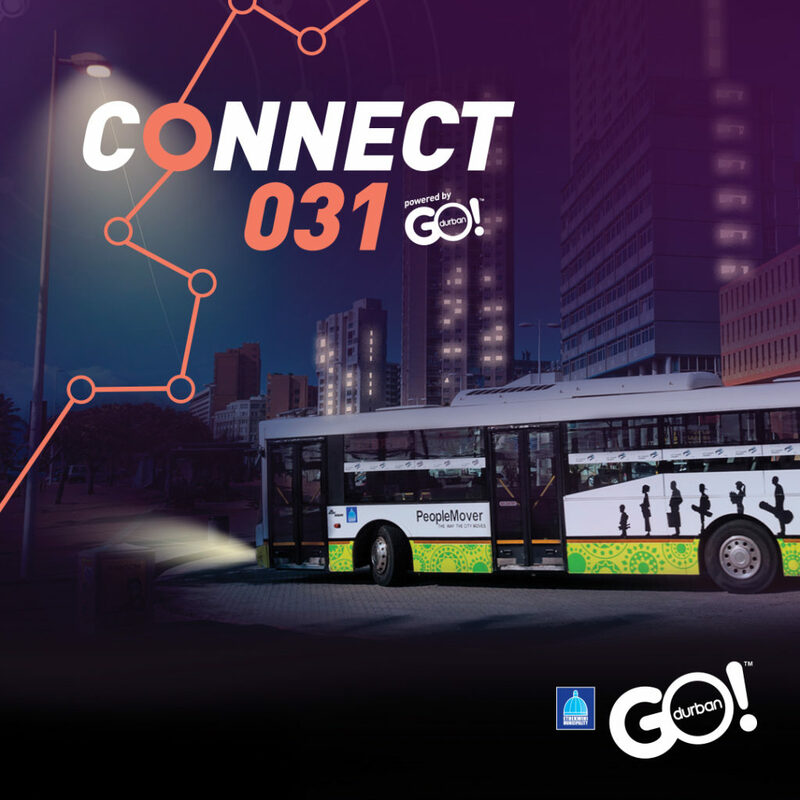 There will be 2 People Mover buses, one from KZNSA and the other from Station Drive, starting at 6pm, with the last bus at 10:30pm. Both busses will head to Florida Rd, stopping at the bus stop opposite the Gin Gallery (just off Sandile Thusi road) and at Gordon Rd Park – see map below. This night service forms part of the eThekwini Transport Authority’s pilot programme that is looking at demand and uptake for public transport to help support the economy that surrounds the activation of arts and culture and local lifestyle venues that host special events and late night trading on the first Thursday of the month. For more info about the service go to www.godurban.co.za or like the GO!Durban Facebook page. Urban Futures Centre and KZNSA LAB talk entitled Staring at Walls, Art in Public Space. Well-known street artist Ewok, will be talking about the role of street art in creating a vibrant city, and taking visitors on a curated tour of some of Glenwood’s most notable street artwork. The Main and Mezzanine Galleries feature a solo exhibition by Andries Gouws entitled “Vertoef/Linger” and the Park Gallery features local art available to purchase. Music this month features Reverie, a jazz duo providing a laid-back vibe. There is local shopping at the KZNSA Shop as well as an Arts Cafe special menu to suit all pockets from 5 – 8pm. Station Drive from 6pm with extended opening hours for the studios, venues and retail shops, and a range of artisan foods, drinks, arts, craft, music offering something for everyone including children. Offerings include: A 3D printing demo and exhibition by The Makerspace at their new premises at the Artisan Studios / Salsa dancing at The Plant / Momenti artisan gelato and vegan sorbets at the Warehouse / Walk-in tattoos at Lightship Tattoo / A group exhibition at the African Art Centre / awesome shopping at The Exchange / The Vans Roots Up DJ collective at the S43 / Distillery031 open until late. On the street will be a street food extravaganza with 10 of Durban’s best food trucks, crowd participation murals, the Poison City open mic and a bonfire under the stars, and more.